The classic cozy room with a double bed and full amenities. 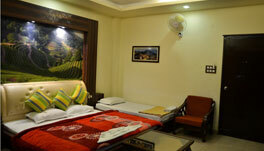 Rooms are very spacious and comfort with family or business. The room includes bath room. The guest will have a quiet night’s rest. 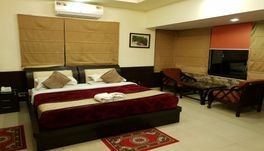 Rooms are wide and with Garden view, Included AC / blower, Toiletries, LED TV, Satellite TV, Telephone, Wardrobe, Work desk, Two Chairs, Vanity Free wifi, hot & cold water & King size bed. Breakfast Lunch and dinner is served daily at Restaurant or Room service features with variety of dishes. 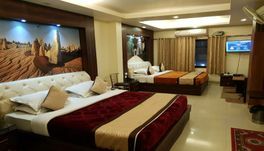 Hotel Rajpur Heights is also known for delicious food we have A/C indoor .terrace & open air garden restaurant your stay at this charming hotel will guarantee you a memorable and inspiring experience.